If you have ever had a crown, it is likely that you had it done in two appointments. Traditional crown placement methods require an initial appointment where the tooth is prepared and an impression is done. The impression is then sent off to a laboratory where the permanent crown is manufactured. 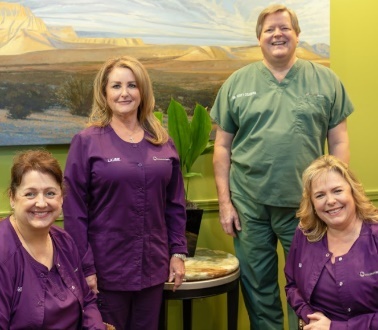 We have found that many of our patients don’t like having to wear a temporary crown between these two visits and feel the entire process is inconvenient. At Coleman Dental, we can do it all in one appointment with our CEREC® technology. After a 3D digital model of the teeth is produced, we can quickly design a restoration with precision and beauty to match your smile. The design is transferred to the CEREC milling unit and created from a solid ceramic block. After final approval, the restoration is seated and you will be ready to enjoy the amazing results. This sophisticated CAD/CAM technology designs and fabricates the crown while you wait. This translates into added convenience for our patients and means no coordination and waiting on an outside laboratory. And most importantly, no temporary crown. Only one dental appointment is required. We have the CEREC technology in-house, so the risk for miscommunication between the lab and our office is eliminated. You don’t have to deal with an uncomfortable temporary crown. The sophisticated CEREC technology helps ensure an absolutely flawless fit that will match your unique bite. If you have questions or would like more information about CEREC crowns, please give us a call at 713-783-2800.